The EasyCloneYALI- Integrative Vector Set contains integrative plasmids suitable for (over-)expression of (heterologous) genes in Y. lipolytica strains. The EasyCloneYALI- CRISPR/Cas9 Set contains plasmids for genome editing of Y. lipolytica via CRISPR/Cas9 technology. The EasyCloneYALI- Integrative Vector Set contains a set of integrative vectors suitable for (over-)expression of (heterologous) genes in Y.lipolytica strains. The vectors allow for selection in prototrophic yeast strains (two different dominant selection markers and a uracil marker for auxothrophic strains). The EasyClone system provides the possibility for cloning of up to two genes when a bidirectional promoter (of any choice) is used, and integration of the construct into 11 well-defined yeast chromosomal locations. Particular biobricks are assembled and cloned into the vectors via Uracil-Specific Excision Reaction (USER) cloning. The marker genes are flanked with loxP sites allowing for marker rescue and recycling, providing the possibility of repeated rounds of gene insertions. Figure 1 legend: The collection contains integrative vectors with dominant and auxotrophic selection markers. The EasyCloneYALI- CRISPR/Cas9 Set contains plasmids for genome editing of Y. lipolytica via CRISPR/Cas9 technology and markerfree EasyClone vectors. The collection contains integrative Cas9 expression vectors and an episomal vector for gRNA expression. Additionally, the collection contains a set of markerfree EasyClone integration vectors and their corresponding gRNA vectors. The system can be used in Y. lipolytica strains, which are sensitive to the antibiotics nourseothricin and hygromycin, or can not use D-serine as a nitrogen source. 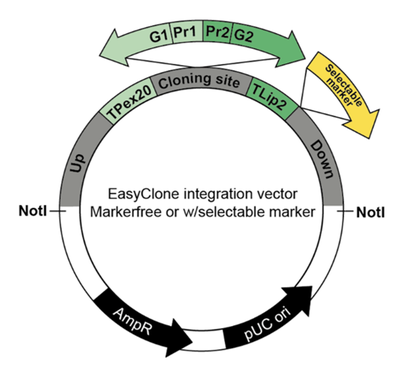 The markerfree EasyClone vector system provides a possibility of cloning up to two genes when a bidirectional promoter (of any choice) is used, and integration of the construct into well-defined yeast chromosomal locations without the use of selection markers. Particular BioBricks are assembled and cloned into the vectors via Uracil-Specific Excision Reaction (USER) cloning. Figure 2 legend: The collection contains plasmids for genome editing of Y. lipolytica via CRISPR/Cas9 technology and markerfree EasyClone vectors for (over-)expression of (heterologous) genes.